Promote recycling, don’t stop it. A new legislative proposal at EU level could make the recycling of plastics from Electronic Waste (WEEE) impossible. The Müller-Guttenbrunn Group, like the international associations EERA and EuRIC, is therefore calling for a course correction. Plastic recycling is good for people and the environment – and indispensable for the future. The World Economic Forum in Davos recognized this more than a decade ago: In 2006, the plastics recycling plant in Kematen/Ybbs founded by the Müller-Guttenbrunn Group together with MBA Polymers, was recognized as a Technology Pioneer 2006. Today, around 50,000 tons of plastics from electronic waste are entering this innovative recycling plant every year. MGG Polymers, as the plant has been renamed into since the beginning of this year, produces high-quality engineering plastics that are used in new electric and electronic equipment. Compared to newly manufactured plastics, one metric ton of recycled plastic saves three to four metric tons of CO2. In addition, only ten percent of the energy requirement is needed compared to the production of virgin plastics from oil. 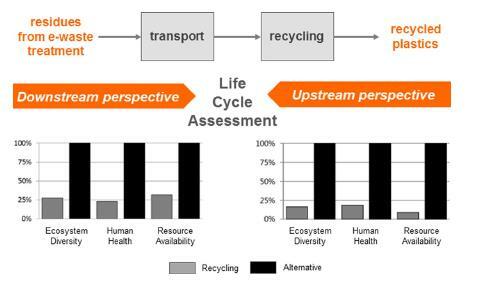 A formal life cycle analysis by the Swiss research institute EMPA shows that plastics recycling is by far the best option compared to both the combustion of old plastics and the production of new plastics (Link). Intelligent technologies ensure that the plastics with hazardous substances from old electronic equipment are separated and destroyed in incineration plants instead of being reprocessed. Examples of these hazardous substances are cadmium in old coloring compounds or certain brominated flame retardants that are no longer permitted. The housing of old CRT monitors, for example, can contain as much as 150,000 ppm brominated flame retardants (ppm = parts per million). With our modern separation technologies, MGG Polymers is able to recycle these E-Waste materials so that the recycled plastics do not contain more than 1,000 ppm of these flame retardants. More and more substances are included in the list of prohibited substances. Until now, when such a substance was placed on the banned list, the legislators set realistic limit values. As a result, these plastics could continue to be recycled and with it energy and raw materials be saved. A legal change as a threat. We are therefore all the more dismayed to note that a current draft law at EU level could mean the end of plastics recycling from waste electrical and electronic equipment. This is in stark contradiction to the targeted Circular Economy plans or the ambitious targets for the recycling of waste electrical and electronic equipment that the EU has defined. Nevertheless, European politicians have presented a draft legislative change law with unrealistic limit values for one particular substance. The proposal is neither substantiated nor feasible by scientific studies. If limit values cannot be measured, they cannot be achieved even by the most innovative companies such as MGG Polymers. We are convinced that this can only be a mistake. This change, if implemented, would endanger both the recycling industry and many jobs: Müller-Guttenbrunn employs 125 people at MGG Polymers who are convinced that they make an important contribution to environmental protection. EERA (link) and EuRIC (link), two major European recycling associations, have put the urgent issue on their agenda to convince European politicians that it is impossible to recycle if limit values are below the measurable range. The two associations therefore call either for the proposals to be withdrawn or for them to be reviewed for values that are measurable and consistent with other European legislation on the subject. The position of the two important recycling associations EERA and EuRIC can be found here (EERA, EuRIC) . Müller-Guttenbrunn thanks both associations for their support and appeals to European politicians not only to continue to enable, but also to support the environmentally friendly recycling of plastics from waste electrical and electronic equipment.